Martin teilt seiner Familie in Frankfurt mit, dass er am 5. ,16. Und 25. 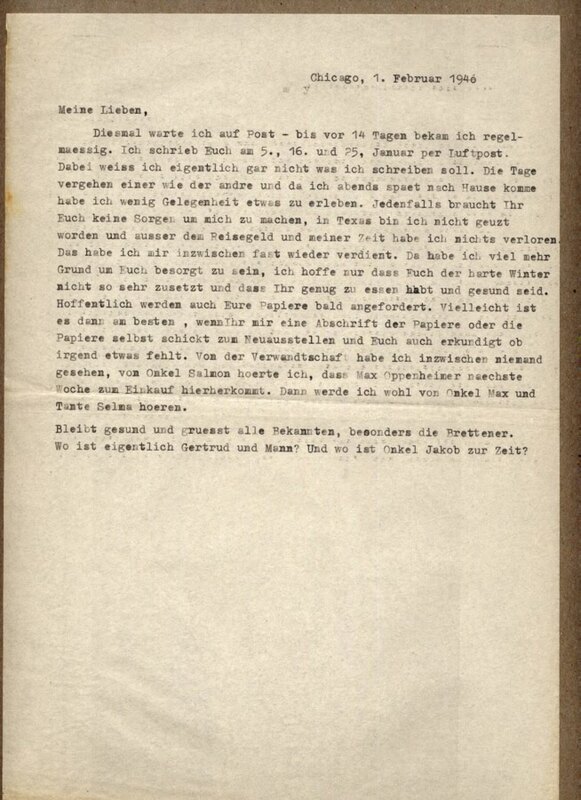 Januar 1940 Luftpostbriefe dorthin schickte, dass sein geschäftlicher Ausflug nach Texas ohne Verlust endete: Er wurde nicht „geuzt“, was so viel heißt nicht „ausgetrickst“ und dass man in Deutschland sich keine Sorgen um ihn machen soll, wohl aber er sich sorgt und sich um die Neuausstellung der „Papiere“ kümmern wird. Now I am the one waiting for the mail – until two weeks ago I received regular mail. I wrote to you Jan D5, 16 and 25 via airmail. Meanwhile I have no idea what I should be writing about. One day follows the other, and as I always come home late, I do not really have anything interesting to write about. Either way, you need not worry about me. Nothing bad happened to me in Texas, I only lost some time and the travel costs, which I have already earned back. I have much more reasons to worry about you; hope the harsh winter does not create too much trouble and you are healthy and have enough to eat. Hopefully your papers will soon be requested. Perhaps it would be best if you sent me a copy of the papers or the originals for resubmission and also find out if anything is missing. I have not seen any of the relatives; I heard from Uncle Salomon that Max Oppenheimer comes next week to make some purchases. Then I will get to hear some news about Uncle Max and Aunt Selma. Stay healthy and give my regards to all, especially to them in Bretten. Where are Gertrud and her husband actually? And where is Uncle Jacob currently?